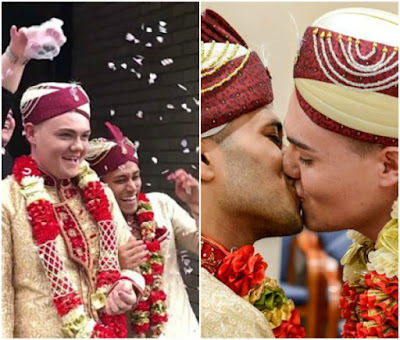 Recounting all he has gone through since he walked down the aisle with the love of his life last week, UK’s first gay muslim to get married, 24-year old Jahed Choudhury, has disclosed that threats he has received so far include an acid attack. According to him, he has been receiving death threats on social media and in the street, since he married his boyfriend Sean Rogan last week. “The worst [messages] say ‘the next time I see you in the streets, I’m going to throw acid in your face’. “Even if I walk down the streets, I have people spitting on me and calling me pig – all the nasty stuff. “You Can’t Be A Gay Muslim, If You Are Than Your Not A Muslim. Another added: “It’s like eating meat and calling myself a vegetarian you are not Muslims. Disclosing what they’ve done about the threats they’ve received while interviewed by BBC, the couple said they had not yet reported the incident to police as they are still considering whether to do so. However, Jahed further disclosed he had also received “amazing” support from his online followers, including people who said the couple had inspired them to come out.